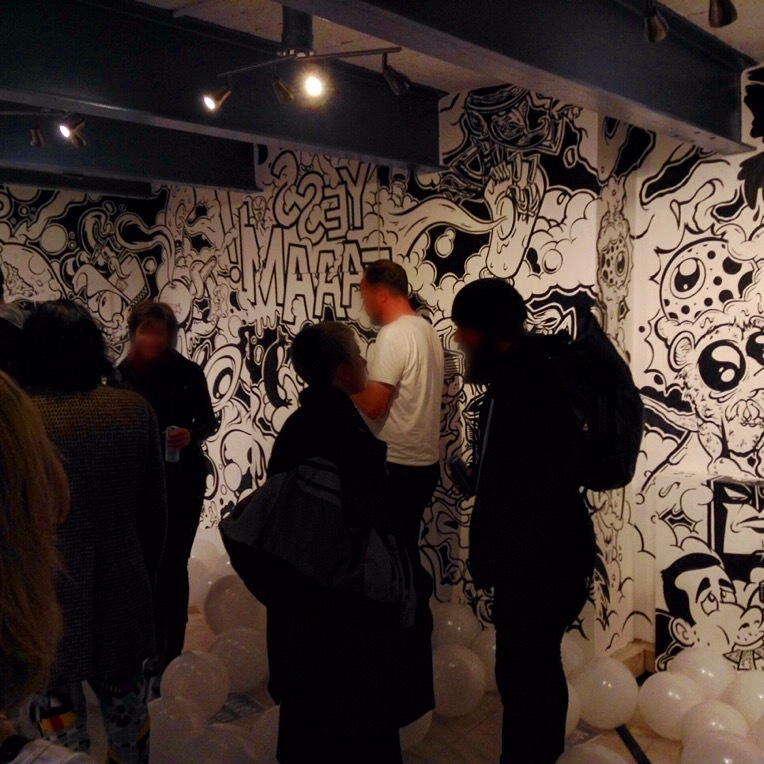 Doing Lines, BSMT Space‘s third and final Street Art Exhibition of 2015 opened last night in Dalston. The brain child of Captain Kris, Tony Boy Drawings, The Real Dill, and Obit, Doing Lines promised to be “hyper collaborative art madness” and “an immersive experience,” according to Captain Kris. The show delivered on the promise. 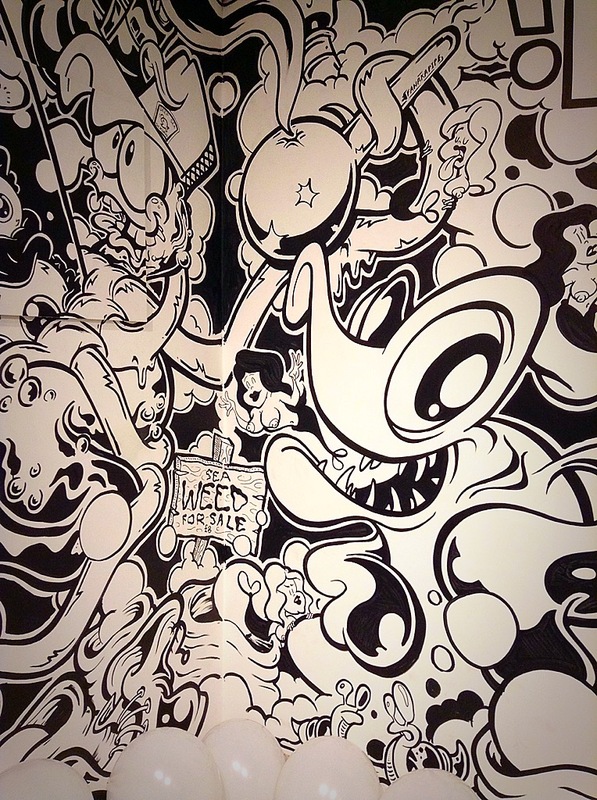 Stepping into the space, one is surrounded on all sides by black and white illustration of the character based genre. The individual illustration style of each artist is present but they merge and interact in ways that create vignettes in true improv fashion. 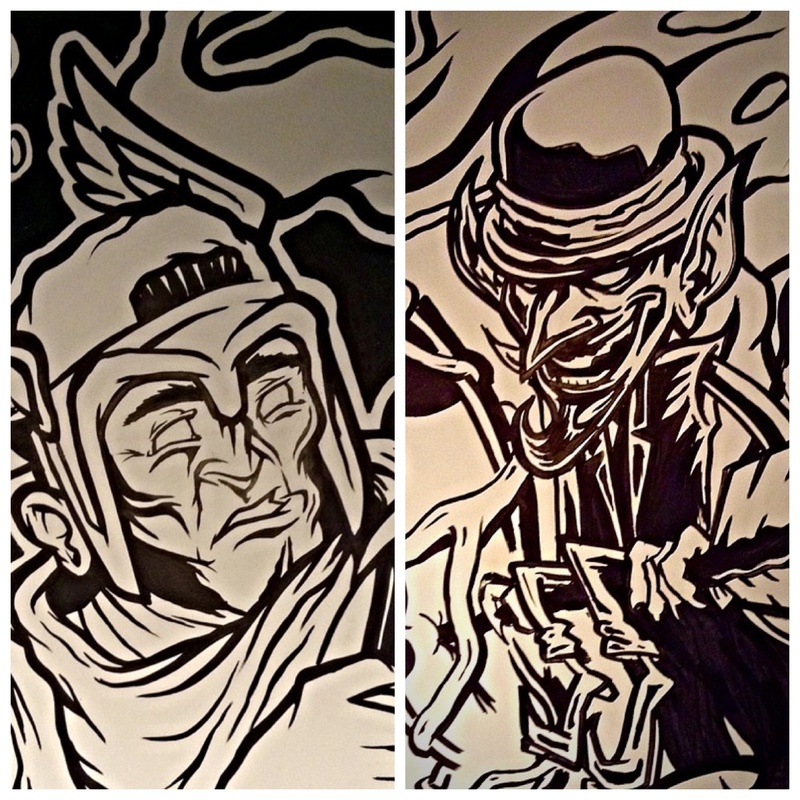 From different vignettes, character by Captain Kris (Left) and Tony Boy Drawings (Right). Art © by Doing Lines Photo by Tania D Campbell. An overarching story begins to unfold as one examines details of a sea scape, a naughty sexual encounter on one wall, a haven to intoxicants in another corner and a foodscape on yet another wall which provides for the inevitable munchies that will result from a wild night of partying. The visitor feels as though they have walked into a larger than life comic book where a party is underway. The text is written in reverse, telling us that we have left our everyday existence and entered inside the world of the story that the images are creating. The party continues with DJ Seeds on the decks spinning wicked tunes and white balloons covering the floor. Entering the space, reversed text makes the visitor feel they are “inside” the story that the illustration is telling. Art © by Doing Lines. Photo by Tania D Campbell. It is clear that the artists, Captain Kris, Tony Boy Drawings, The Real Dill and Obit have created a fun time for the visitor, improvising the piece, despite the three days and nights of hard work it took to create. The improv does not end with the artists. We are meant to become a part of the story. The white balloons lay strewn upon the floor and markers lay at the ready for visitors to draw themselves into the story as merry party goers. A visitor, artist 616, “draws himself” into the story. Photo by Tania D Campbell. And it isn’t just by drawing that one can enter the storyline. A voluptuous naked woman is positioned in a waiting pose for a sexual encounter. She is drawn exactly at the height where a gallery visitor might be inclined to position himself or herself to enjoy the encounter – were the illustration a real woman, or were the visitor made from illustrator’s ink and able to step out of this world and onto the wall. 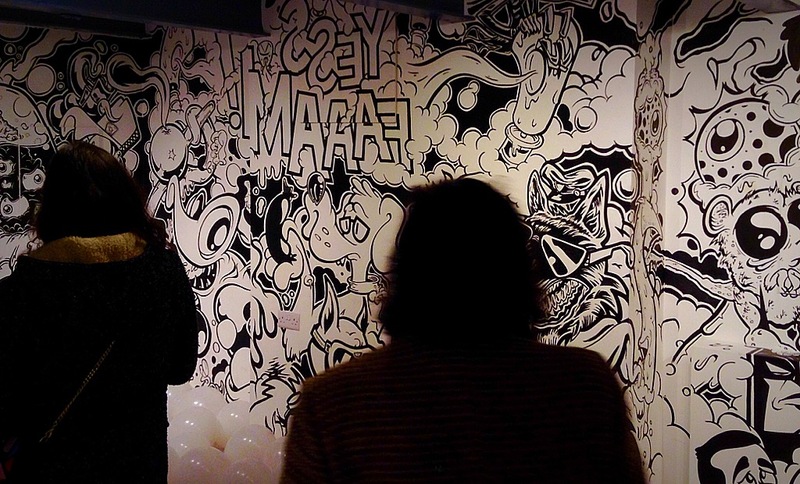 Masters of mixing performance art with street art, the energy of the piece continued at the opening with live drawing. 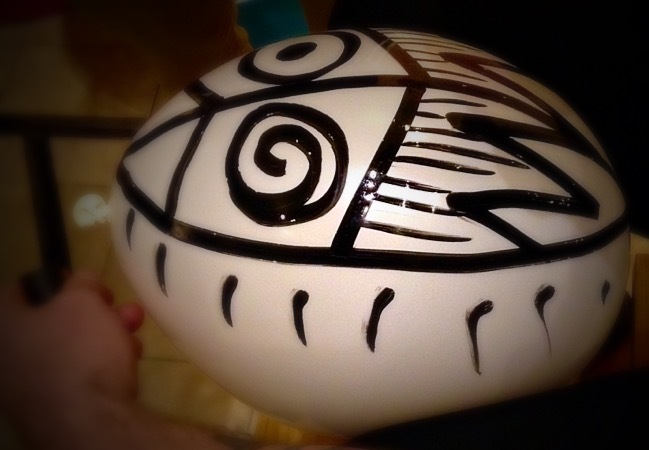 All in all, an evening of community and mirth was created between artists, and gallery visitors. A small number of works are available for sale, including a limited edition signed print, and several canvases which had been carefully hung and concealed on the blank walls at the start of the jam. Keeping to the promise to be different from the usual “paintings on walls” shows, the canvases for sale from Doing Lines were completed as a consequence of being part of the blank wall for the improvisational 3-day illustration jam. 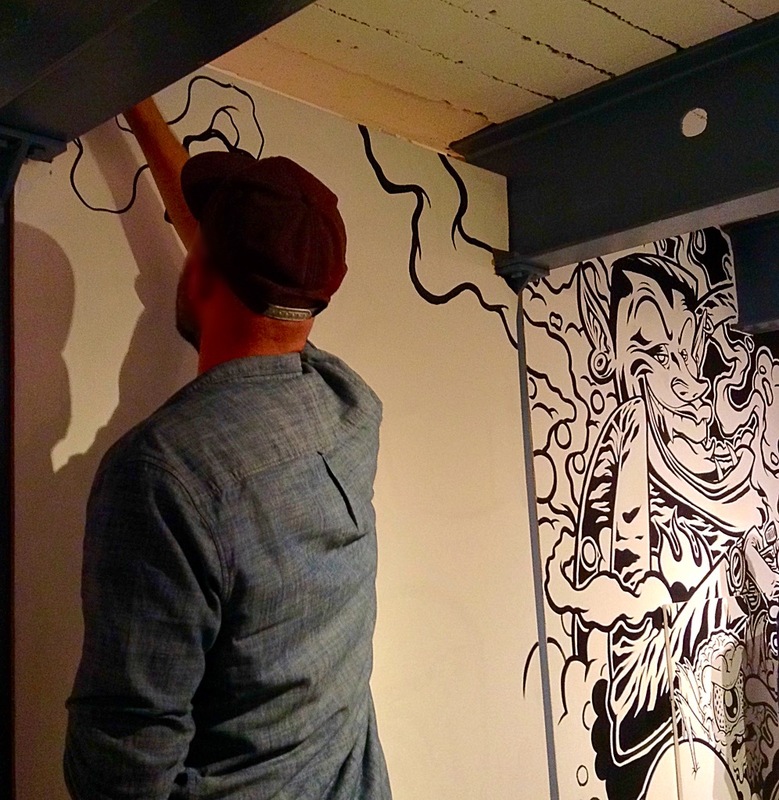 A massive amount of fun, the immersive party atmosphere continues at BSMT Space with the Doing Lines walls on exhibition through 14 November.